Not for a music concert but a book fair! I have never seen any city take the written word so seriously, it’s really amazing. It’s also why UNESCO named Buenos Aires the World Book Capital for 2011, a designation that changes cities every year and was previously held by Madrid, Alexandria and Montreal (yay Canada!). 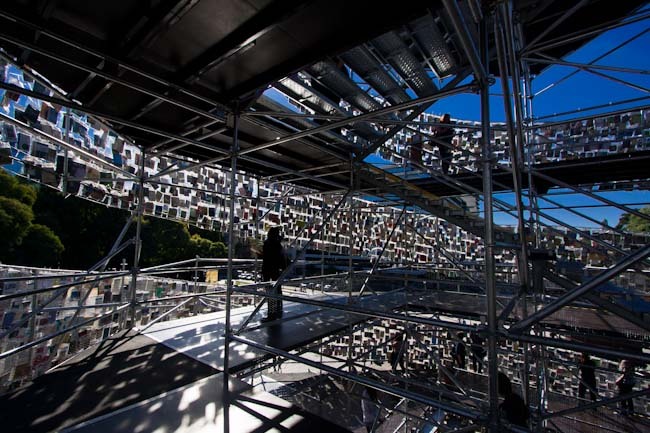 Coinciding with the Book Fair and UNESCO honour was the unveiling of The Tower of Babel by Marta Minujin. 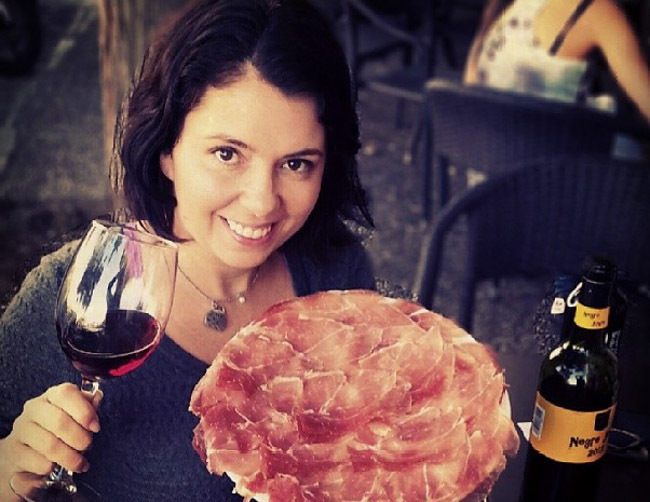 She is likely Argentina’s most famous artist and is well known with the international avant-garde crowd. She’s been around for a while, hung out with Andy Warhol and seems like a character. She is best known for her bizarre mattress sculptures but also holds performance art events called happenings. 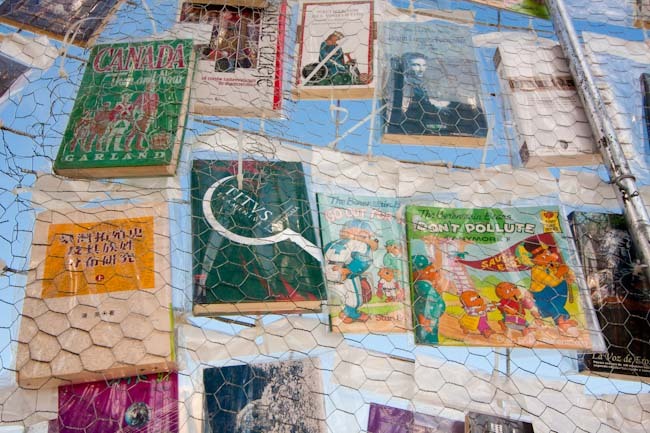 The tower was created using 30,000 books. The United States embassy provided 1000 and Ecuador provided an impressive 3,500. As you walk up the tower you see books in every language that range from poetry to political. The tower is 82 feet tall and as you climb it you hear a recording of Minujin’s saying book in different languages. She has said that like the original Tower of Babel her mission is to unite all people and questions the need to have different languages. Near the top I found a little piece of Canadiana with an old book called Canada – Then and Now and a childhood favourite The Berenstain Bears. While Buenos Aires can be expensive, like most art events this one is free. 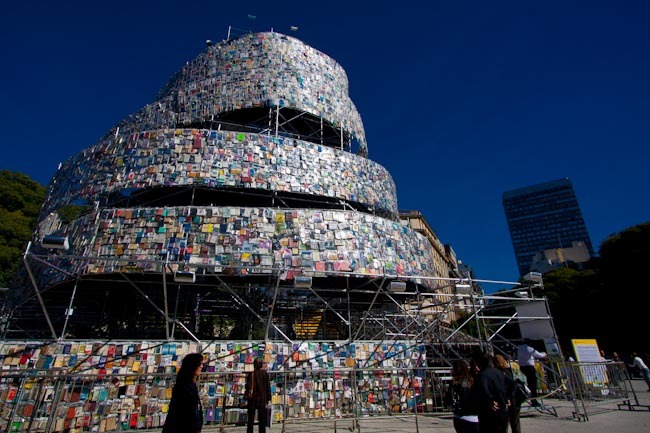 The tower was installed in a public square and when disassembled the books will be given to the public. Minujin says her artwork is inspired by the motto that “everything is art” and I am starting to believe that. I absolutely love this! Sounds like such a cool exhibit and she sounds like a very intelligent woman. The Bernestain Bears used to be my favorite too! HAHA… boing! thats awesome. I love installation work. I didn’t knew Buenos Aires is this year’s World Book Capital! It will be gone by then but the city has so many art events I am sure something amazing will be here. This is very interesting, I love books, so a book fair is heaven for me. So many art events, its impossible to see them all! I am a bookworm too although English books are hard to find and expensive, I should have tried to steal at least one! Ahhh…books! What could be better! What’s an old version of Canada Then & Now…it looks like an edition I used when I first started teaching and that was long ago! I know, I would love to look through that book! Wow… this is so cool. I like what you said about the artist questioning the need for different languages. i would love to be able to better communicate with everyone I meet while traveling. Learning a language is a part of learning new culture…but not understanding a common language in the first place can also be the biggest hindrance to learning any new culture in-depth. It’s so true here, especially since I find the Spanish particularly difficult. But now I can see your photos and know the rest of the story, so I can pretend I had patience. Ahh I went online, you can make a reservation and just show up at the right time. Although I showed up half an hour late and they did not care. That is indeed fun. And gorgeously weird. I see they’re wrapped in plastic to protect from the elements – does that mean you can’t get into them and leaf through the books? Because that would be fun too. A Tower of Biblio with benches where you can read? Well, okay, maybe that’s missing the point of it. But I like that the public gets the books at the end. Nice touch. I wanted to flip through the Canada Then and Now book, especially since Now looked like it was 1954. A very impressive tower indeed. I love this type of art project. This city is filled with creativity like this, it is amazing to see. I believe that too. Very interesting project. And the Berenstain Bears was a favorite of mine when I was a kid, how cool! Me too, for a second I thought they were Canadian but Stephanie knew of them as well. I would be in paradise and make sure to stand in line when the books are given away. What an interesting post Ayngelina. Thanks Inka, considering the line to climb the structure I am sure there will be a bigger one for the books! As a former librarian, my first concern was what they were going to do with all those hundreds of books, so I’m glad they are giving them away! 30,000 books all given to the people, it’s amazing. Wish I could be there to experience this in person with my daughter. There were tons of families there, it was really nice to see that absolutely everyone goes to art events. This is amazing. I saw a photo in the little village paper in Colombia yesterday. I remember The Berenstain Bears too. 🙂 So cool they’re going to give all the books away! It’s amazing how many people had heard of this internationally but it was so cool to see. As a total book geek, I would love to see this! Oh man, that is too cool. A real Tower of Babel. I remember Buenos Aires being full of countercultural art… graffiti, zines, punk shows and little gothy teenagers running around. There’s even a whole “dark” mall to go to where I got my one and only tattoo. Have you found that one? It’s totally bizarre, wish I remembered where it is. I haven’t seen that mall but I am definitely going to ask around. love it. is there some sort of social commentary the artist is making with the tower? Well its about there not needing to be a language as one unit it is understood by all. 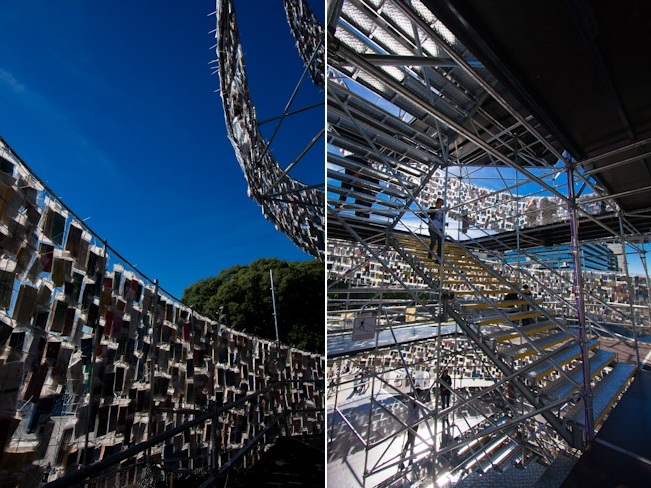 This is really cool – being obsessed with books I am hoping the installation is still there in October! Any idea when it’s coming down? Unfortunately it is being taken down at the end of the month but I am sure they will have some other amazing thing – there is no shortage of art. Noooo! Oh well, it’s the book city all year, right? Am sure there will be other cool things going on. What’s the second hand book (english language obv) situation like in South America by the way? I think I’ve read you saying somewhere that it’s pretty dire? Should I come prepared with a bag of books? English books are really expensive and hard to find. The best bet is hostel book exchanges but they are usually terrible. I am getting a Kindle before I come back in the Fall. In the end it is much cheaper than trying to find books. I love this work of art and Marta Minujin’s mission to “unite all people”. 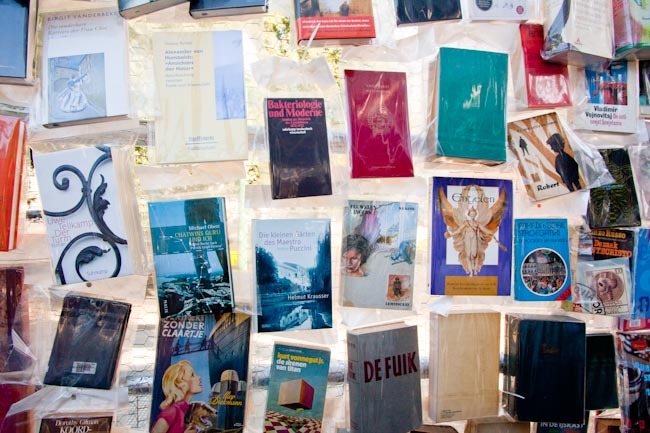 Good for Buenos Aires being recognized as World Book Capital! Art is so accessible here, most of the events are free and when I went to see the tower the symphony was playing beside it as they do every Thursday. As a bookaholic, I’m totally loving this. Especially with the emphasis on ereaders and ebooks, it is absolutely gratifying to see this. I commend you for courageous move. I’m hearing of and meeting many people who feel the need to do the same. This looks awesome. Really impressed by the idea and how it looks. Would love to see more art projects like this. What an amazing tower… anything that has even the slightest connection to Warhol makes me happy. Yay! You went. 1) I’m so jealous. 2) My dream is to have an actual library in my house and since I heard about this now I want THIS kind of library. One that twines around with visible book covers and down below are comfy chairs to sink into and get lost in unchartered worlds. All by reading. I would have totally tried to poke for an “opening” to peak a look at the Canada book. I adore books and book fairs!! What an impressive tower of books. I didn’t know about World Book Capital, but I’ve just added another thing to my bucket list. funnily enough i used to love that story from the bible. The Tower of Babel was awe inspiring especially with God decided, enough was enough.. MWUAAHAHHA! Great post – fabulous pix of the tower.. i love it! Wow you know your stuff! This looks soo great. We had to miss out Argentina completely during out time in South America. Will be on the list next time though, seems like there is lot to see! There is so much to see in South America, Argentina can wait! Wow. As a bookworm, I absolutely love this. Do you know when they’re disassembling it? I’d hate to miss seeing this. This is one of the coolest art installations I’ve ever seen. I love reading and interesting to see that BA is a city of book lovers. P.S. I love The Berenstain Bears too! OMGGG, this is like my dream book fair. So awesome!! Love books, and love the berenstain bears. Not so sure about the Tower of Babel and its implications, haha. This is so cool, we saw it when they started to set it up and we were wondering what it’s going to be when done. Now we know, thank you!!! Looks awesome!!! That’s so cool! Love the artist’s concept. The more I read about Buenos Aires, the more I want to visit. That is so amazing! I love books…and The Berenstain Bears of course! 🙂 I think I could spend hours just hunting down favorites. You have to love exhibits like that, right outside your door. For me, finding them here is the first battle, but it is always great to see what someone else views as art, almost like a little insight into how they see things. Have never heard of it but that sounds interesting. Amazing, I love it, what a wonderful place to wander about. What a great event. Yay to Montreal for having been recognized previously.